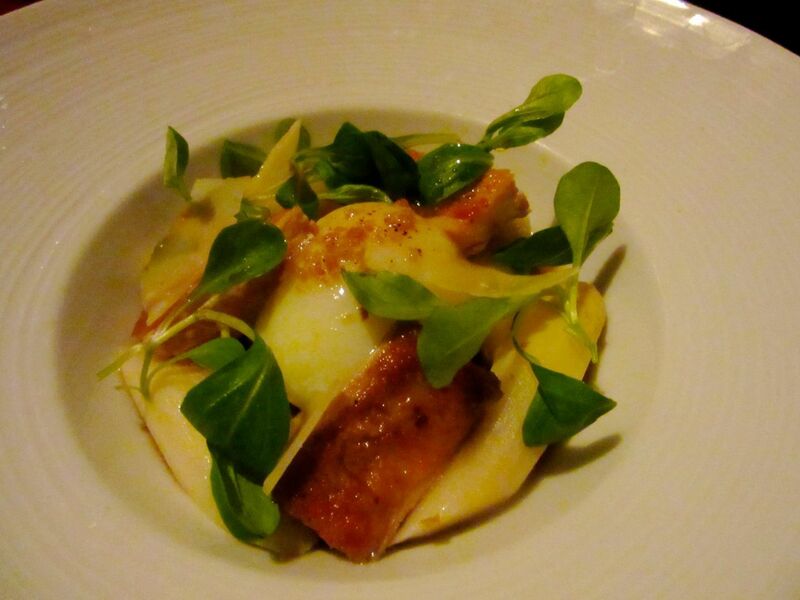 I was wowed by this ragout of roasted sea scallops with squid, cèpe and bacon in celery root puree. 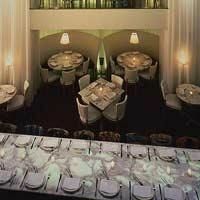 I love being on Ian Schrager’s list. I can’t guess what list I’m on. I’m sure it’s not the A list, could be the C list or even D…All I know is whenever Ian completes a project, a custom-made memento arrives --- unique, striking, always of unimpeachable design, discreet, exquisitely wrapped. Recently I received a tall white box held closed by an elegant white faille ribbon. 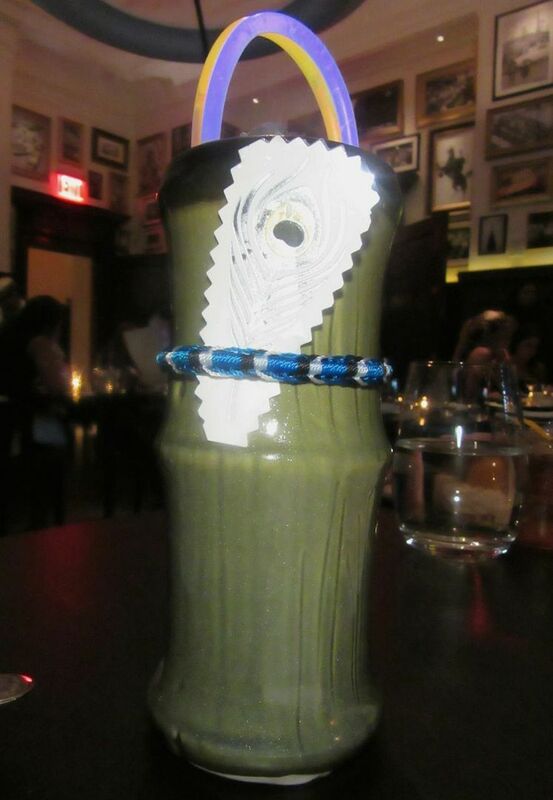 Inside was a sculpture in dark chocolate of the Clocktower Building, site of Schrager’s New York Edition hotel. It was once an insurance company. Now it’s the landmarked upstairs bar. I hated to mar the perfect sweep of chocolate by actually eating it. But ultimately I took a bite of the base. Better me than a cockroach. I read that Ian had brought in a chef from London to run The Clocktower restaurant. Bizarre, I thought, but then, maybe not. I haven’t been to London for forty years. What do I know? 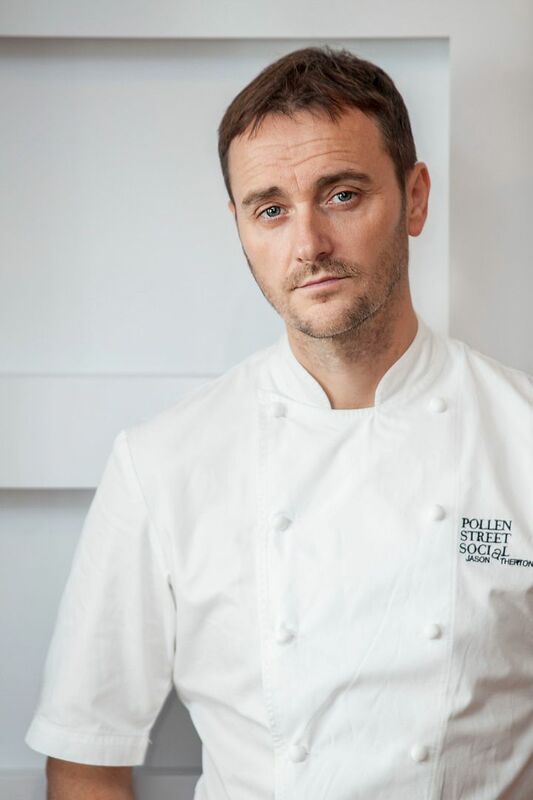 Jason Atherton had already won Michelin stars for Pollen Street Social, Social Eating House and City Social: his Berners Tavern sizzles in Ian’s London Edition Hotel. The Clock Tower’s service style has some martial airs. I couldn’t wait to eat at The Clocktower. 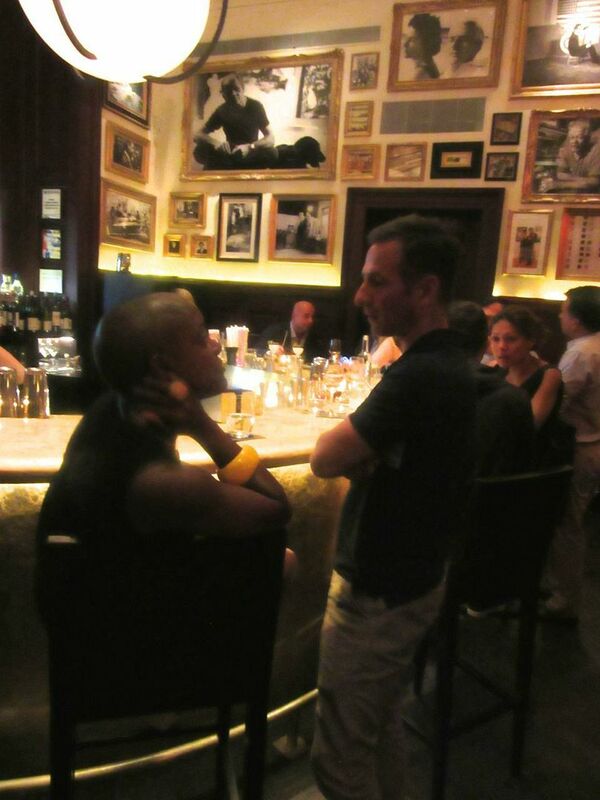 By the time I called anonymously, I ran into the usual hot-new-spot-in-Manhattan churlishness, 5:30 or 9:30 tables only. Unwilling to join the early birds, I made an indiscreet call to someone with connections and booked at a slightly more civilized hour. You might start at the lobby bar and work your way upstairs to dinner. The Schrager brand dance starts at the tall front doors: Adorable lads greeting you as if you were Helen Mirren, asking about the quality of your day. I remember the moves from the glory days of The Royalton. 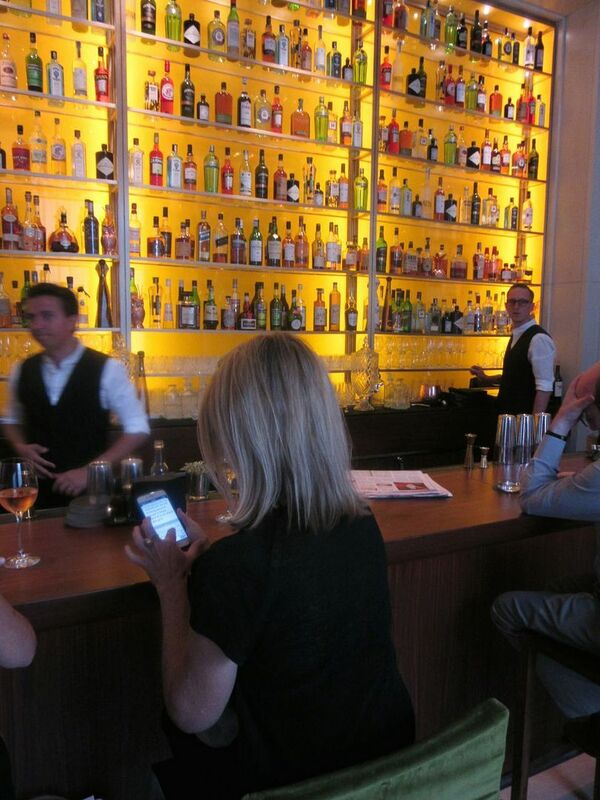 Would I wish to linger in the Lobby Bar? Or shall an elevator be summoned? 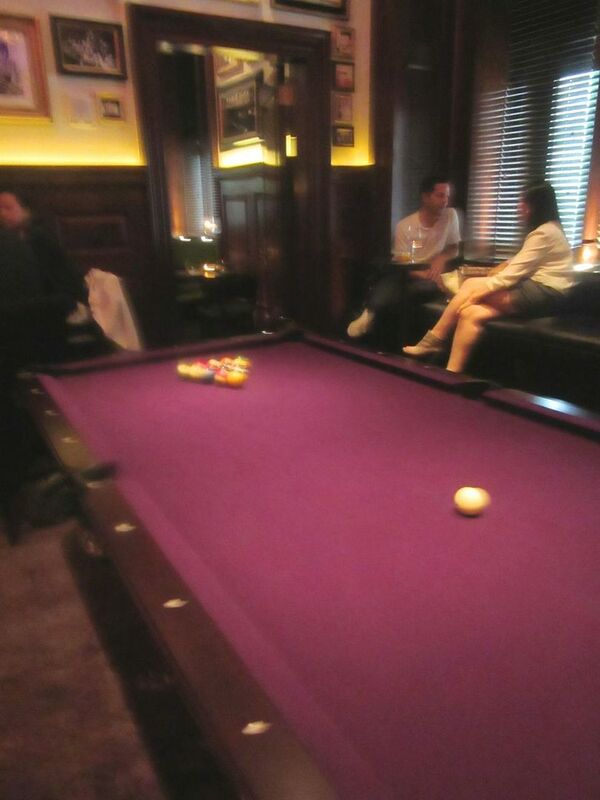 The purple topped billiard table fits right into Ian Shrager’s hotel fantasy. On the second floor, slightly more substantial young men flock around in effusive welcome. It’s not Helen Mirren they revere. It’s me. They know that my pals are waiting in the bar. Yet another bar. Pause to glance into the billiard room. Ian always has a billiard table. The felt is a vibrant purple. A duo of racy-looking women sip cocktails. 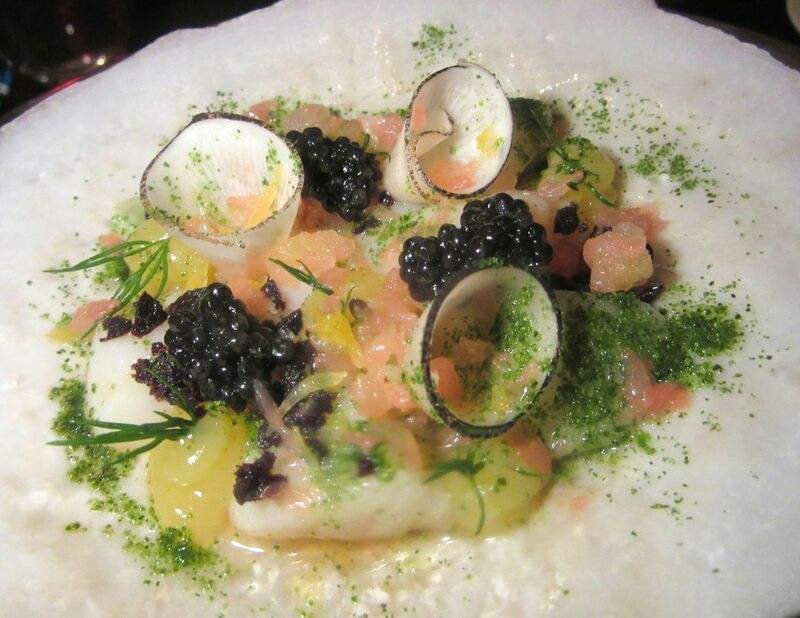 Raw diver scallops are luscious tossed with black radish curls pomelo and dribbles of caviar. Onward to table. We’re settled into a corner of the Jade Room. A faint pale green glow from a frosted flying saucer anchored overhead gives it the name. The walls are paved with framed photographs. For a moment, I am reminded of the Polo Bar. It’s clubby for sure, English clubby. The Brits do the best clubby, as Ralph long ago discovered. But it’s darker, minus Polo’s cosmetic glow. It’s so dark there are candles on the floor in the hall so you don’t trip getting into the elevators. I wanted more sea urchin brine in the uni risotto with peekytoe crab and bottarga. I think Ian has a disco hangover. I could do without the music but he can’t. DJ Chelsea Leyland curated the playlist. Ian especially likes the ‘90s rock‘n’roll. The abundant staff rotating in and out of each dining room is friendly too. Just like Polo. Nice must definitely be the new haughty. Depending on your mood the Gap Year rum cocktail with glow sticks can be amusing. The cocktails are okay, but I’m not an expert. At least they don’t sneak above $16 at the drop of a small batch bourbon as Polo's do. The cold-infused coffee Bulleit bourbon “Cold Fashioned” pleases Barry who’s ordered his second. Barry’s the expert. I don’t realize when I order the Gap Year that it comes with a friendship bracelet, glow sticks and a fake tattoo. It’s the rum and pineapple that got me. I feel ridiculous in the glow. People are probably staring. It’s difficult not to eat too much bread with this addictive buttermilk-infused butter. Our server Lloyd has introduced himself and not stopped providing hyperbolic guidance for 15 minutes. We’re four. Everybody gets to order two dishes. My expectations are at half-mast. Then the bread arrives, a small beige round, already cut in four. “Rye IPA,” Lloyd informs us. “With buttermilk infused butter.” I never put butter on bread, but, of course, now I must. 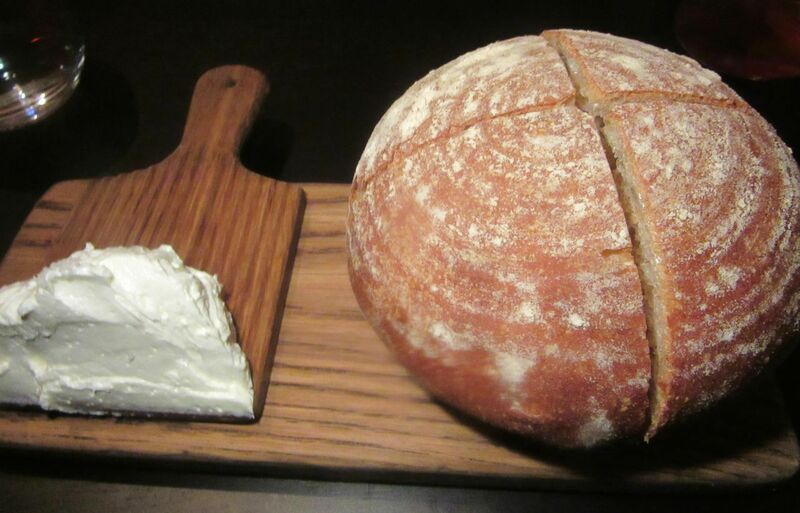 It melts on the warm yeasty dough and fills my mouth with cream and crumb. I get a rush that makes me tingle. Here are fifty ways to cook a chicken and serve it with sublime white asparagus. Not everything is as exhilarating as raw diver scallops with black radish, pomelo and outcroppings of black caviar presented over ice on a footed silver compote. 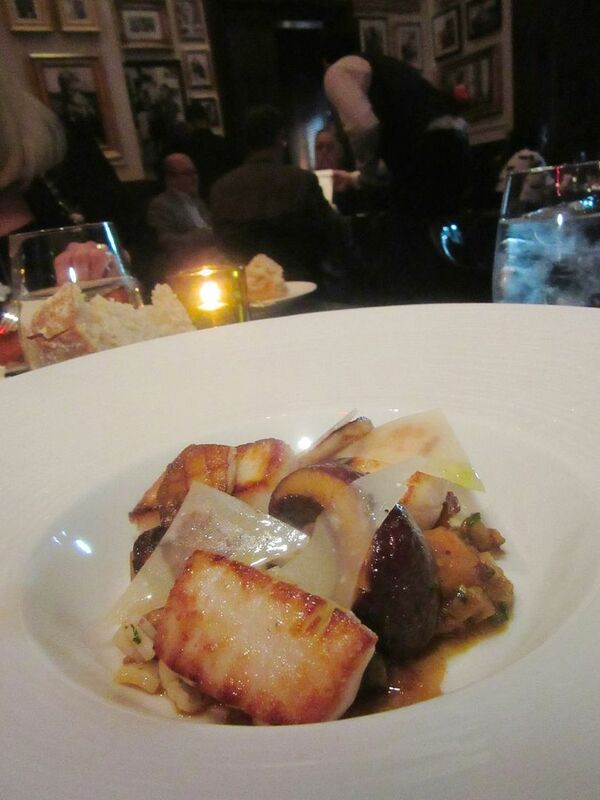 Or as rousing as the ragout of roasted sea scallops with squid, sturdy cuts of cèpe and bacon in a celery root puree. I’m not sure it needs the chicken jus but otherwise you’d miss the cute chicken sauceboat. Nor is everything as striking as warm white asparagus with chicken thigh and chicken cornflakes – fifty ways to cook a chicken. 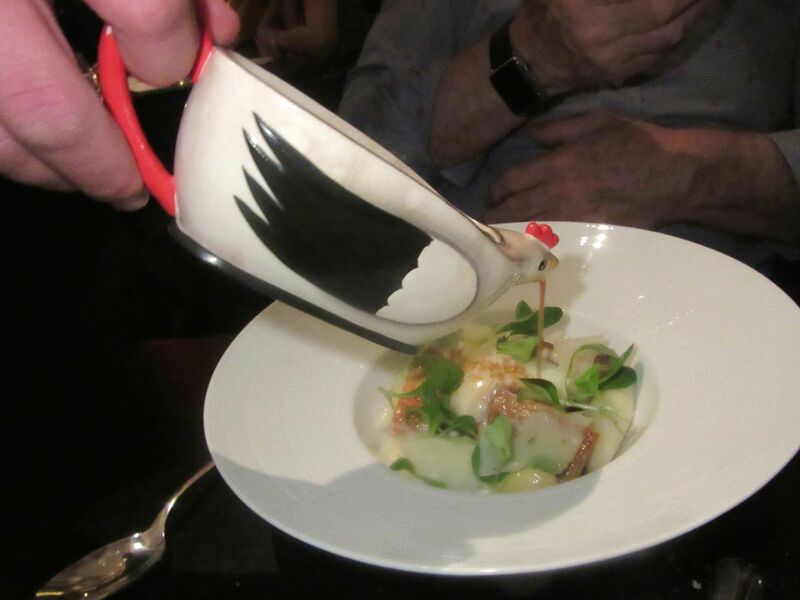 A captain pours chicken jus on top from a chicken-shaped pitcher. “We have a dozen of these in the collection,” he advises. 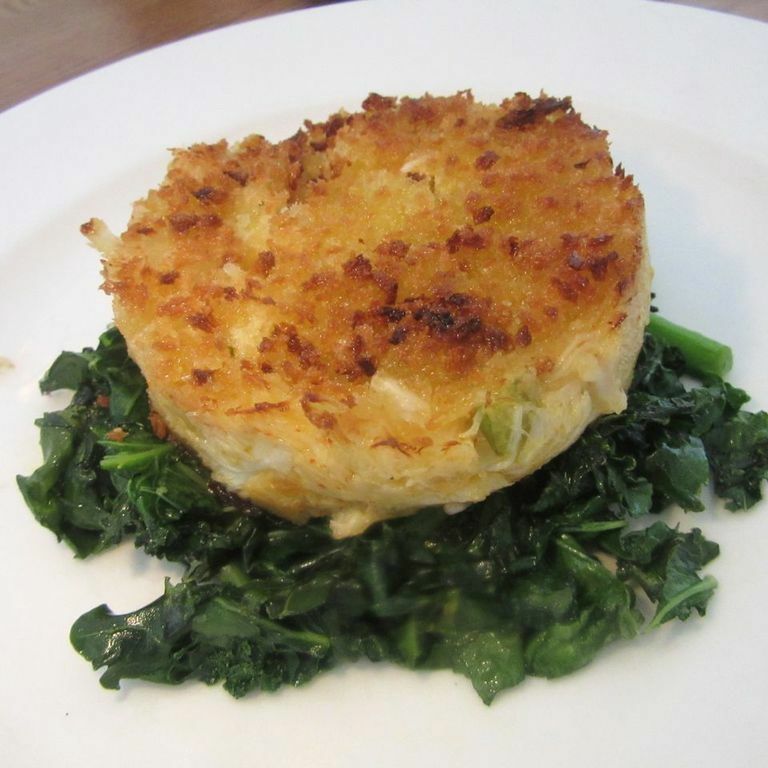 There are patches of Parmesan and a slow-cooked egg to jiggle until it spills all over the asparagus gathering. I have never had white asparagus so firm and fresh in this hemisphere. This triumph of white asparagus doesn't necessarily need the distraction of chicken, but, nevermind, it's sublime. In fact, everything I taste in two dinners here is good or very good or curl-your-toes-dizzying. Peeled tomatoes and burrata get decked out with tomato gelee and basil granita. 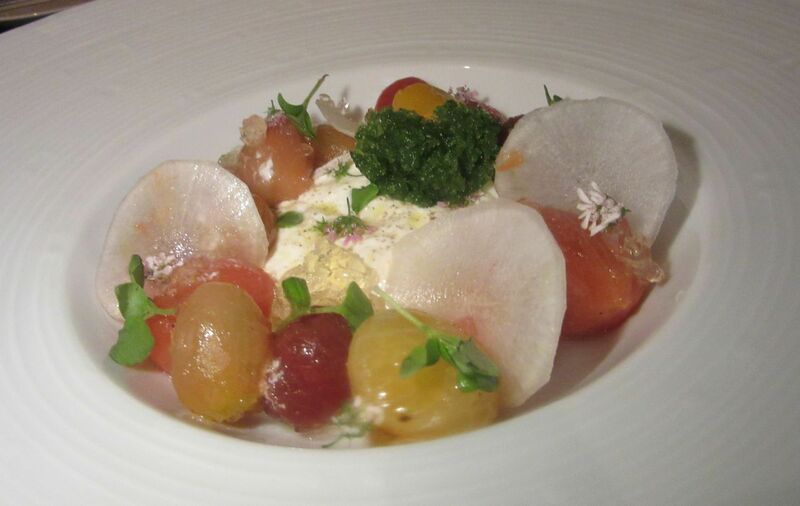 Still, the tomato salad is an original: peeled egg and cherry tomatoes with tomato water gelée, radish thins, basil granita and burrata, sourced from the Lioni Mozzarella company in Brooklyn. A starter of olive oil poached and hardwood smoked salmon with walnut powder (I’m not sure how or where) is perfectly fine. Lightly pickled green grapes provide a nice acid shock and sassy little drops of thickened verjus are a tease. 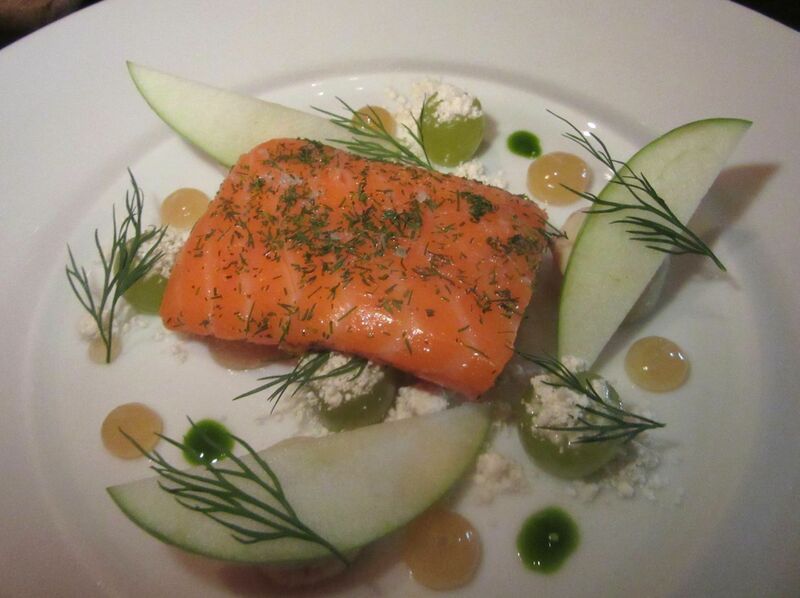 Olive oil poached and smoked salmon comes with pickled grapes and verjus. The curls of paccheri with a showoff of morels, chunks of melting oxtail cheek and see-through patches of parmesan may not make your mom’s macaroni and cheese, but you’re grown up enough to appreciate a delicious exaggeration. 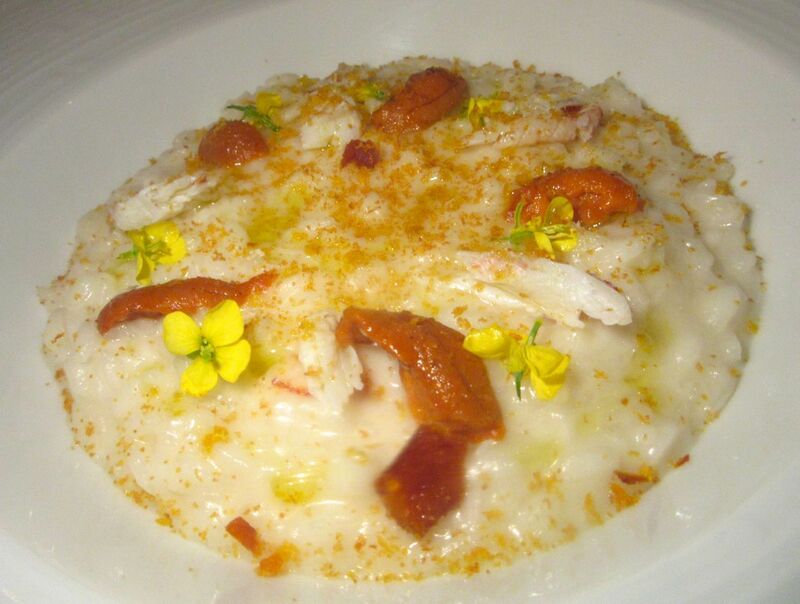 The uni risotto with peekytoe crab and bottarga could use a stronger dose of sea urchin. But portions are large. 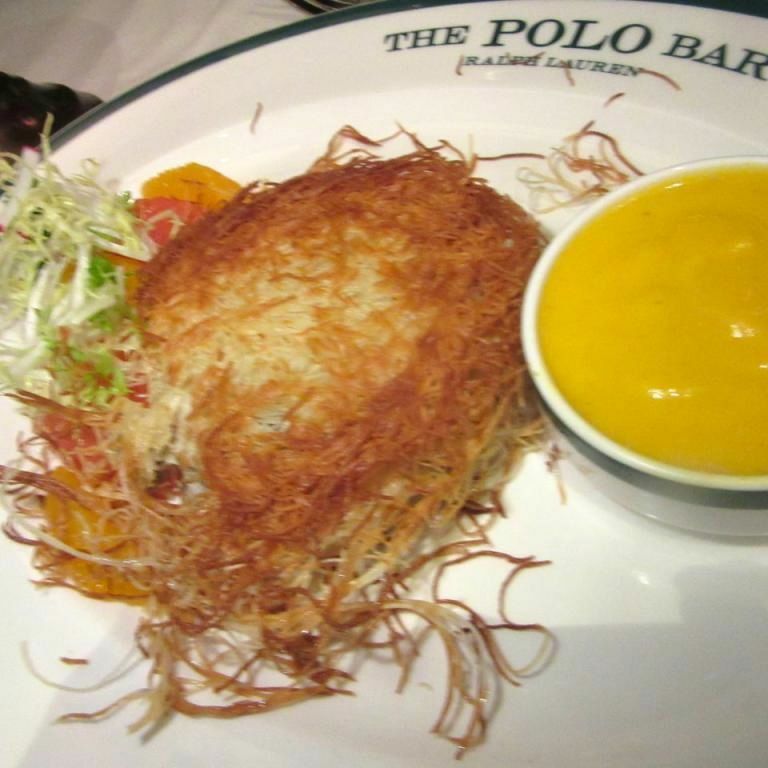 Two starters could be dinner. Forget Mom’s macaroni. 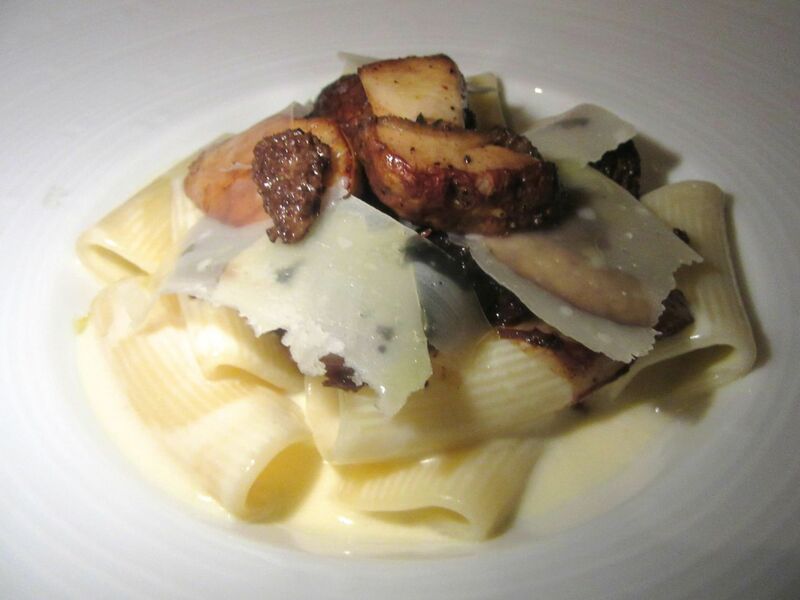 Paccheri with slow-cooked oxtail cheek and morels stands on its own. 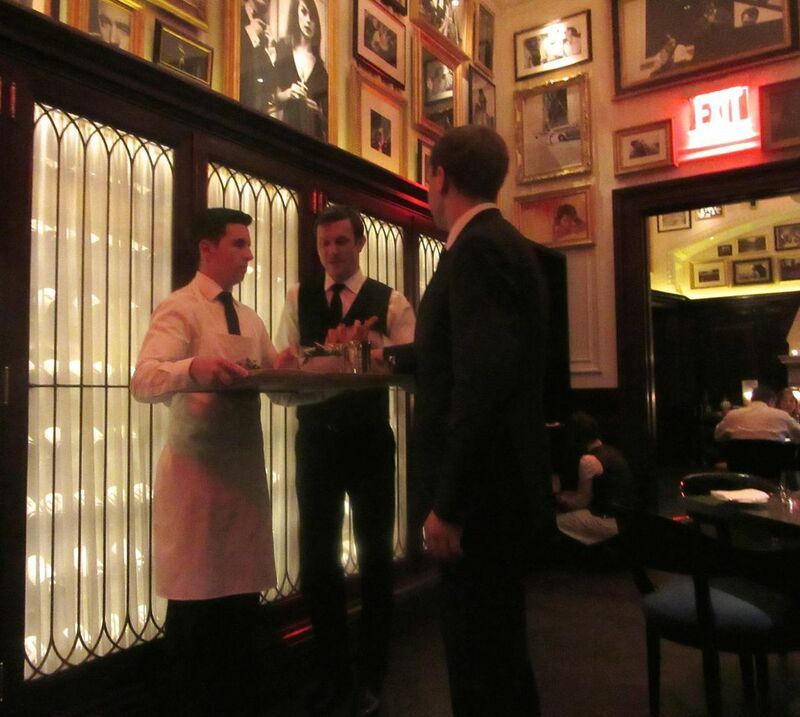 Servers in white aprons with food from the kitchen stand silently like robots as waiters in striped aprons and captains remove the dishes and set them on bare black wood tables. Obviously, laundering tablecloths is more expensive than hiring a scullery to wipe away the condensation from water glasses six or seven times during the meal. There’s delicious mush under the bird’s crusty skin and smoked dark meat makes savory leek tartines. I might not be quite so amused by all the tabletop fuss if it weren’t that the food is mostly wonderful. I like the chicken sauceboats (as I liked the glass chicken at Dirty French). I don’t mind that the $65 roasted chicken for two requires delivering a wooden smoker box to the table just to serve two small smoked thigh and leek tartines because they’re exotically tasty. 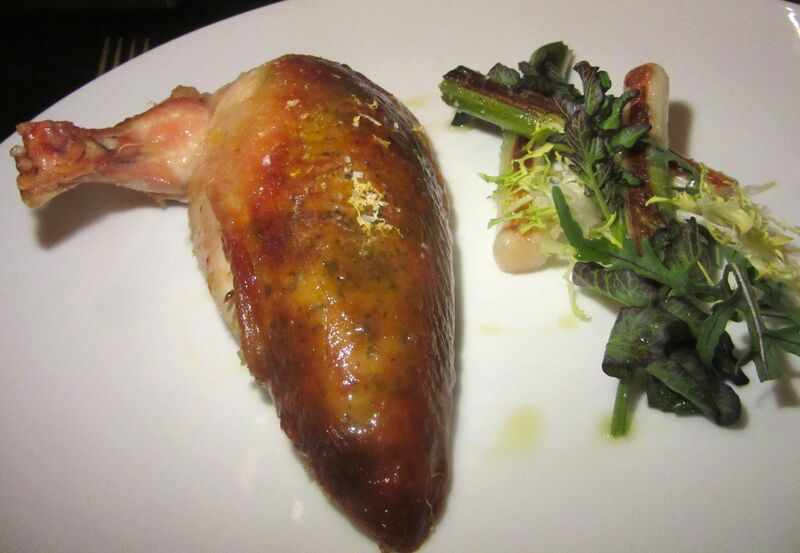 I like the mash of leek, brioche, butter, parsley and thyme tucked under the crisp skin of a remarkably moist breast. I took the steak plate literally and thought it might be saying too much meat can kill. It’s the promise of béarnaise sauce and triple-cooked chips that prompts me to order the $65 bone-in 40-day, dry-aged prime strip steak for two of us on another evening. 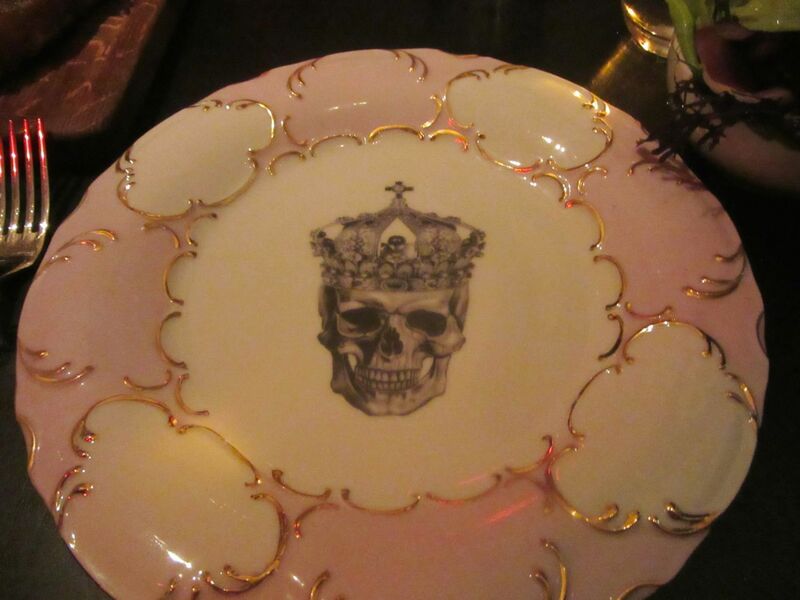 I do get upset when our waiter set down the house’s rococo steak plate: pink and white with a black death’s head in the center. “We have these in every color,” he observes. “Are you trying to tell us we shouldn’t eat steak because it could kill us?” I ask. 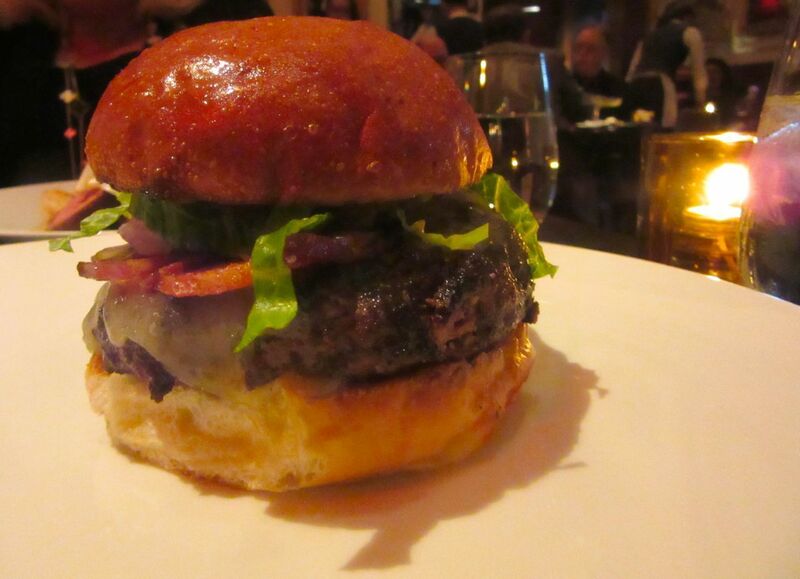 I’ll be back for the dry-aged burger with bacon and cheddar but soggy chips need a rethink. My friend and I had ordered a “dry-aged” half-pound burger too – as an extra. As long as you’re thriving in denial, why not? I cannot persuade our waiter to put the burger on a smaller plate so it fits in the center of the table between the pink death’s head and my companion’s plate of excellent duck breast a l’orange with fennel shards and turnips that are a little too al dente. He prefers to have our dinner plates hanging four inches over the edge of the table. Nothing in his training has prepared him for this challenge. Steaks come with Béanaise, a brilliant little salad and allegedly triple-cooked chips. Finally, he gives in to my increasingly annoyed request-commands, takes the steak to the kitchen to be sliced in ¾ inch chunks, and brings a smaller plate for the burger. 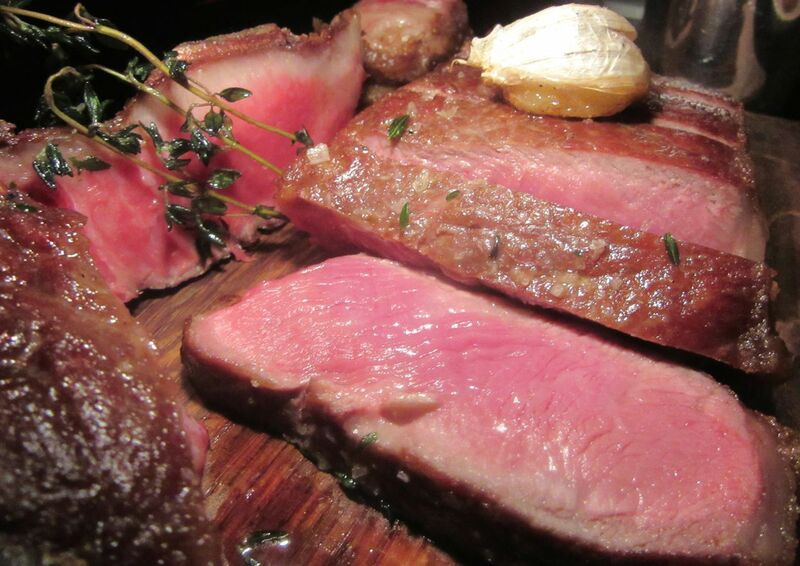 And yes, the sirloin is rich in flavor, judiciously salted or overly salty, depending on one’s taste. We can only manage small cuts of the burger, a must we promise to return to next time. “Chips,” of course, are Brit for French fried potatoes. These are fat and soggy and very pale. But the small salad that comes with is formidable, full of small sprigs of weeds and things I’ve never seen before – baby greens Atherton tasted at Upland where the chef Justin Smillie was not eager to share his farm source. But gave in. 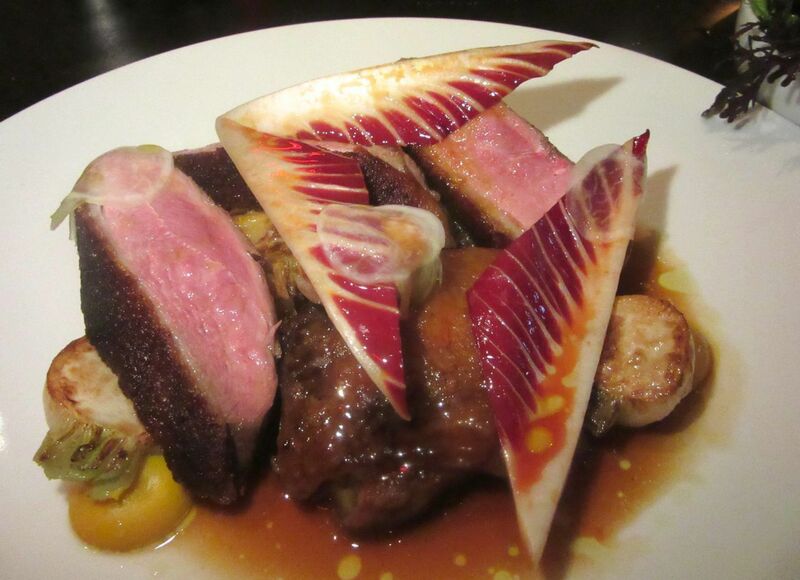 I commend the rare duck breast with sauce l’orange under leaves of fennel and endive. While some American chefs struggle to cook something original by tossing together unlikely ingredients or throwing a few more into the mess, Atherton has done it by being British. And desserts by the house’s French pastry chef, Sebastien Rouxel (formerly of The French Laundry, Bouchon Bakery and Per Se), seem almost English in juxtaposition. 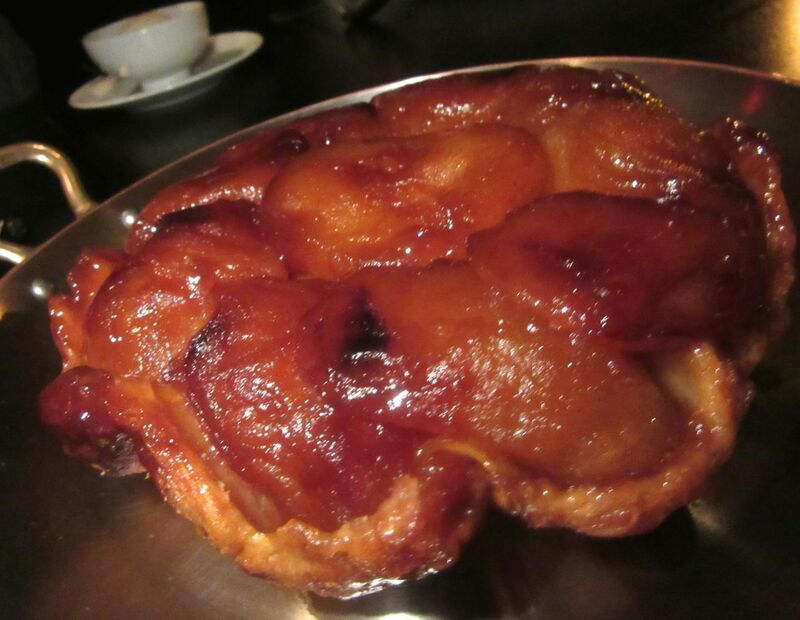 The Pink Lady apple tarte tatin was much too sweet but we ate it anyway. His sumptuous pink lady apple tarte tatin for two (enough for four or more) with vanilla ice cream in separate little dishes is shockingly sweet. That does not stop us from devouring it. 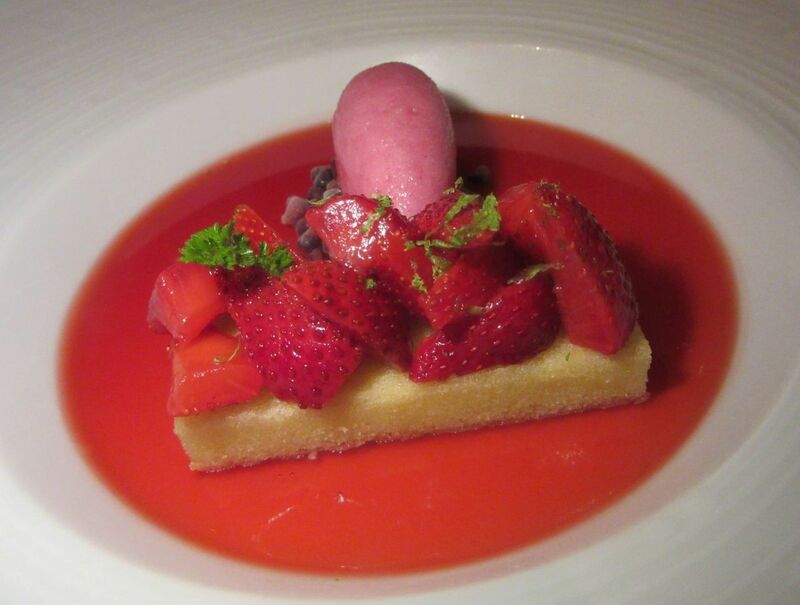 And on another evening the “strawberries and cream” with berries on a small island of olive oil cake and verjus sorbet moored in a ocean of berry-glazed vanilla custard, strikes me as wonderful English nursery food for adults. Sorry, Sebastien. I am getting carried away. 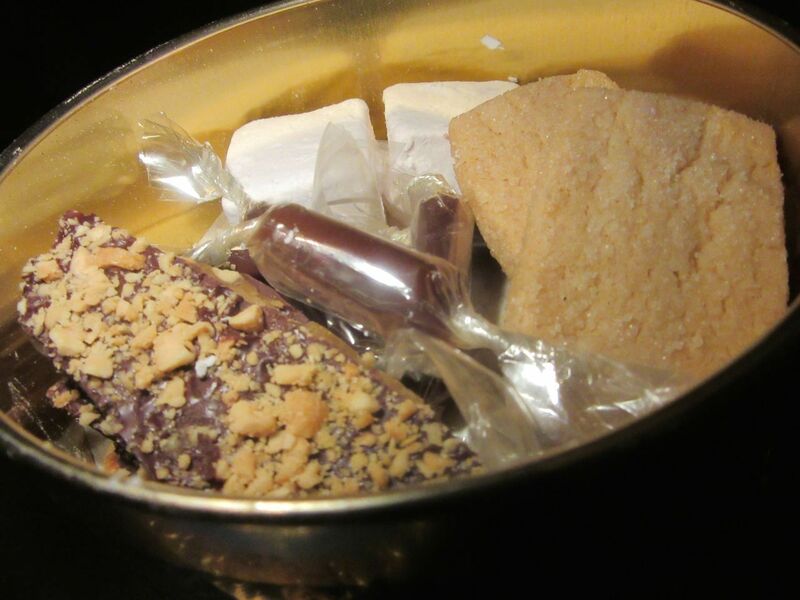 I am also seduced by Rouxel’s mignardises that arrive inside a vintage candy tin with a young Queen Elizabeth on the cover: butterscotch in cellophane wraps, rhubarb marshmallows, English toffee bark and Scottish shortbread cookies. 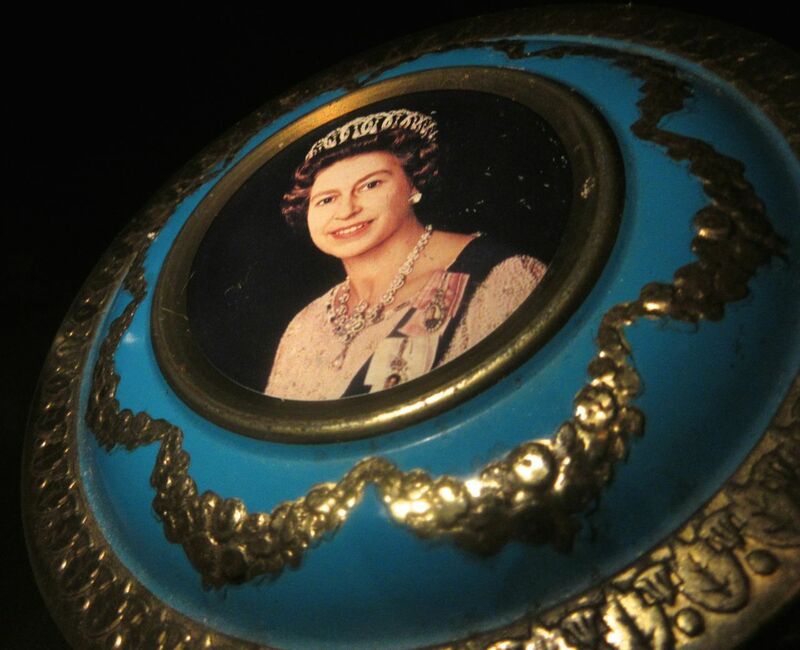 I collect old tins so I could have stolen this one which is why I don’t carry a big tote. No temptation. I have left out the brilliant design by the Rockwell Group working with Schrager’s fantasy and the hotelier’s design team: the clever use of dark wood and fake cupboard doors to get around the landmarked interiors of this 1909 building. Rockwell’s 30-foot long, hand-forged, blackened steel fireplace in the lobby and the distinctive staircase, a continuous freestanding curve of steel with wood inside. I like that there is one of each goodie for each person – a nicety you don’t see everywhere these days. The color concept changing in banquettes and the illuminated glass globes by artist Eric Schmitt link the three dining rooms that were once insurance company offices in this 83-seat restaurant. Photographs cover the walls (as they do in London). Here they are music stars in the billiard room, artists in the bar, and cultural icons in the blue room. And yes, this is Schrager country so there is a catalogue with diagrams and the names of the photographers that you can ask for and take home. The pastry chef is French but this ode to strawberries with delicate custard strikes me as very English. We are cynical. We are New Yorkers after all. We dare to ask if the quality of the products will slip or the prices will rise when the house stops to figure out food costs. We wonder what will happen when Jason Atherton, who came here with a team made up of 12 main chefs of all his restaurants, goes back to his complicated London and international restaurant life. No need to worry, I am assured by Stephen Starr, the Philadelphia restaurateur who, like Atherton, is a partner in The Clocktower. Ross Bryans, the executive chef at Atherton’s Pollen Street Social, has already moved to New York. Chef-Partner Jason Atherton chose this portrait. Life is full of surprises, as Ian could tell you. He signed up to develop Edition hotels as a global concept in his style for Marriott who sold it and now manages it for the Abu Dubai Investment Authority. That doesn’t make it any easier to get a table at a civilized hour. But you might just walk in on a holiday weekend. The French master Joël Robuchon got a table for ten last Friday night -- when toot New York was already headed to the country and the Hamptons. By the time we left the restaurant, magician David Blaine was doing tricks at his table. 5 Madison Avenue, Entrance on East 24th Street just east of Madison. 212 413 4300. Breakfast daily 6:30 to 10 am. Lunch 11:30 am to 3 pm. Dinner Sunday to Wednesday 5:30 to 10 pm. Dinner Thursday, Friday and Saturday to 11 pm.